Corner view of the Novosbed mattress. Nothing sleeps better than a memory foam mattress. Body contouring and motion isolation for more restful sleep. Experience it with our industry best sleep trial. Memory foam's high owner satisfaction rating is no accident. Its unique properties conform to your body, relieving pressure points. Motion transfer is minimized so your partner's movements don't disturb you. Our next-generation memory foam is also more durable, providing years of reliable comfort. Look no further than memory foam, nothing sleeps better. Many sleep trials let you try a mattress, but what if it's not quite the right firmness? You are forced to either settle for something you don't love, or to return it. We offer something better! Say hello to Comfort+. It comes free as part of your sleep trial so if you need to, you can fine-tune the firmness. Make your Novosbed the perfect firmness, guaranteed. Is Novosbed the right bed for you? Based on 234 real owner experiences with this brand. 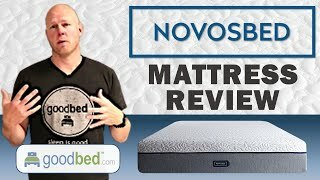 How do people like you rate their Novosbed mattress? Mattresses are personal. Filter the 234 Novosbed ratings by sleep position, weight, age, gender and more to find the ones that are most relevant for you. Novosbed mattresses are recommended by 79% of owners on GoodBed (based on 234 ratings + 58 reviews). Want more reviews from Novosbed mattress owners? Do you have something to say about your Novosbed mattress? Write a Review! Cover Details: Ultra-soft stretch knit cover is removable and washable. Note: The product line specifications above were derived from the active Novosbed models listed on GoodBed. As a result, these details may not be comprehensive and may not apply to all Novosbed models. If you are seeking specifications for a particular Novosbed mattress, please search for that mattress by name on GoodBed, or check with your local Novosbed dealer. Novosbed is a mattress manufacturer founded in 2009 that is based in Edmonton, AB in the Canada. Additional product details can be found by viewing discontinued mattress models from Novosbed.